A man shares his opposing views with pro-democracy student protesters in the Mong Kok district of Hong Kong, Oct. 18, 2014. Hong Kong's government says it will likely begin talks with student demonstrators on Tuesday, after nights of clashes between police and pro-democracy protesters who have paralyzed parts of the territory. Hong Kong Chief Secretary Carrie Lam said Tuesday is the earliest of the three days the government gave to the Hong Kong Federation of Students. She said good progress has been made in preparation for the dialogue. Hong Kong Chief Executive Leung Chun-ying answers questions from media during a press conference in Hong Kong Government House, Oct. 16, 2014. 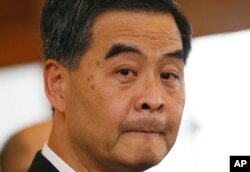 A few days ago, Hong Kong Chief Executive Leung Chun-ying said he was seeking ways to resume talks with protest leaders that stalled earlier this month after the government backed out. Leung has said he is open to discussing universal suffrage. But communist authorities in Beijing say they will not change a decision to vet candidates for the territory's 2017 vote and will not enact more electoral reforms. On Saturday, riot police using pepper spray and batons clashed with dozens of pro-democracy protesters shielding themselves with umbrellas as the protesters continued to occupy a camp in the city's Mong Kok district. Officials say 26 people were arrested and 15 police were injured in the early morning scuffle. "Police strongly condemn those who participated in the unlawful assembly, charged police cordon and illegally occupied major thoroughfares in Mong Kok earlier this morning and last night. Such behaviors are neither peaceful nor non-violent. They seriously undermined public order and seriously jeopardized public safety,'' said Hong Kong Police Commissioner Andy Tsang. "It would be impossible to solve the issue by clearing us," said university student Ashley Lai. After you do a clearance, we will just come out again. What we really need is for the government to face us, to have a dialogue with us." Three police officers were injured Friday as police tried to control thousands of protestors coming back to Mong Kok, an area they had been cleared from in a pre-dawn raid.